"Master Sergeant Roy P. Benavidez, MOH - West Point"
Caption: Kathy Mueller, daughter of Lloyd Mousseau who died in Roy Benavidez's arms stands opposite Derryl and Darin Wright whose father Leroy Wright was killed on the mission for which Roy Benavidez earned the Medal of Honor. Col. Ralph Drake (left) was Benavidez's commanding officer at the time of the action. 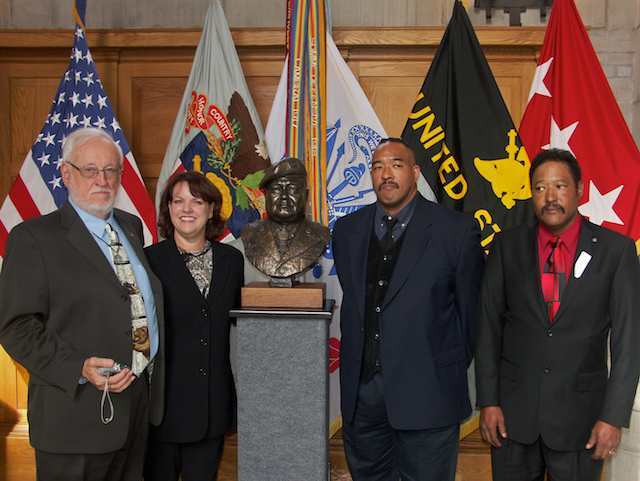 Place: Thayer Award Room, United States Military Academy, West Point, NY.